World War III starts with Soviet and Cuban soldiers invading the United States and occupying large swaths of the land of the free. But America is also the home of the brave, and in a small rural Colorado town, a group of high school teenagers take refuge in the mountains and wage guerilla warfare against the occupiers. Red Dawn deserves some credit for imagining an outlier Cold War scenario, and examining the consequences of bringing a foreign war to the United States. The portrayal of citizen resistance against foreign occupiers seems inherently odd when it's American civilians having to fight a large traditional army, since real-world conflicts have never involved Americans in the role of the oppressed. Getting past this fundamental premise is a stretch but could have been worth a view, except that Red Dawn does not help itself with an asinine script courtesy of director John Milius and Kevin Reynolds, the latter most infamous for later drowning Kevin Costner's career in Waterworld. The occupying Cuban and Soviet forces are generally portrayed as vicious buffoons, despite somehow possessing the skills to pull off a successful invasion to begin with, and the lines of dialogue throughout the movie would make an eighth grader proud. The combat sequences have a lot of bullets flying, mostly serving to perforate any sense of reality with non-survivable wounds. Red Dawn does earn back some respect by not flinching from the ultimate outcome of a group of teenagers taking on a large army: the good guys are decimated, and victory has to be found within the ashes of annihilation. The cast is an entertaining gallery to spot many famous, soon-to-be-famous and never-quite-famous faces from the mid-1980s. 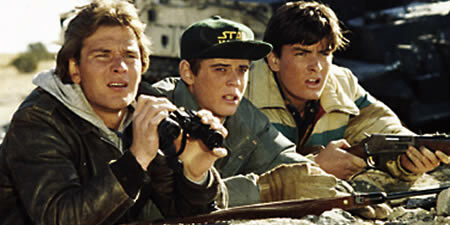 Patrick Swayze leads the teenage rebels, joined by his brother Charlie Sheen. C.Thomas Howell, Jennifer Grey and Lea Thompson are also in the group. Powers Boothe joins them briefly as a downed fighter pilot, and Harry Dean Stanton has a single but over-the-top memorable scene as the incarcerated Dad of Swayze and Sheen. Deep into the cast Ben Johnson and William Smith add colour to secondary characters. 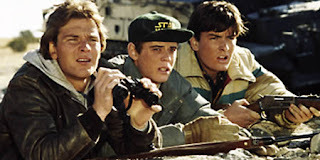 Red Dawn's tragedy lies in the lingering impression that with an injection of a little more talent behind the camera, a classic could have been created. As it is, it's a movie that best resembles a comic book for pre-teens.